Nothing beats the freedom of hopping into your boat in Tofino and heading off onto the cool waters of Clayoquot or Barkley Sound. Whether you're headed to Cannery Bay for some r&r, on your way offshore in search of the big one, or just on your way to work, boating is usually one of a coastal dwellers most cherished pastimes. Unfortunately, your day can be ruined by an accident, an injury at sea, or a breakdown. Many of us have been witness to the embarrassment of someone stranded on a mud flat and waiting for the tide to come up. Rocks and islands are often given the names of those who accidentally wind up on top of them. 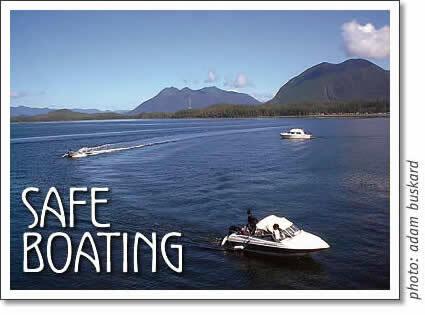 Luckily, there are some really simple ways to make boating more safe and enjoyable. First and foremost — be prepared. Ensure you have the proper safety equipment on board, and that you know how to use it. Tell someone familiar with you and your vessel about your plans for the day, and give them an estimated time of your return. How else will anyone know if something goes wrong and you are missing? Always have a radio or some means of communication. A handheld radio can run as low as $300 these days, and you can even find them second hand. If you are in immediate danger, send a Mayday with your position on channel 16 of your vhf radio. Say "Mayday, Mayday, Mayday" followed by your vessel's name and your position three times. Tofino Coast Guard Radio should hear this and will send appropriate aid to your location. If you are using a cell phone, direct access to marine aid can be made by dialling *16. Is your vessel in good repair and ready for a day on the water? Most breakdowns are simply the result of running out of fuel - a sure-fire way to put a bummer on the rest of the day. Got fuel, and it still won't run? Check your kill switches if you are so equipped, ensure throttles are in neutral, fuel lines are connected and not kinked, and that your fuel filter is not full of water. Batteries, fuses and electrical connections should in good shape and free of corrosion. Pump your gas ball, and turn the key for another try. Check the weather and tide conditions. Continuous marine broadcasts are available by calling 726-3415. Consider delaying your trip if there are wind or fog advisories. Remember that weather can change dramatically in the course of a couple hours. "Where in the fog are we?" If you do get caught, slow down, try to get your bearings, and if you have to, call for help. Search and Rescue vessels can use direction-finding equipment in conjunction with your VHF radio to locate your position if necessary. Plan your route. Always carry a local chart, and know what hazards, rocks and mudflats may stand in your way. Charts will also provide you with a foolproof way of finding some of our local treasures. Look for black bears at the heads of small creeks, whales in muddy-bottomed bays, and fish over anomalies in the ocean floor. You can also investigate future anchorages or wilderness hikes. Remember that water does not come equipped with road signs, or yellow lines. We share these waterways, and there are rules regulating the conduct of boaters in order to prevent accidents. These are known as the Collision Regulations. They are international regulations that apply to all mariners and the most basic ones are as follows. If you meet another vessel head on, both vessels should alter course to starboard (right) and the vessels should pass each other portside (left) to portside. If two vessels are crossing one another (coming together at an angle), the vessel that is on the right has the right of way and should keep her course and speed. The vessel that is on the left must alter course and stay out of the way. A vessel that is overtaking (passing) another vessel must keep clear of the vessel being overtaken. Finally, if you run at night or in the fog, navigation lights are a must. These are available in all price ranges including battery powered ones for $31. There are other necessities to ensure yourself a safe voyage. Always carry a waterproof flashlight. They have saved the lives of more mariners than you would believe. Bring clothing appropriate for all types of weather, and don't forget your hat and sunglasses. Grab some water, snacks and your fishing gear; if you can bear it, leave the alcohol for when you get home. Have fun and make sure you make it back safe and sound. Give yourself the pleasure of ending your day with that exhilarated, exhausted type of feeling that comes from spending the day under the sun and over the salt. You know you'll sleep like a baby. Heather Shobe is a Coast Guard officer and will be teaching a Safe Boating Course Thursday May 11th, 2006, 6-9pm and Saturday May 13th, 2006, 9am-5pm. Students will receive a Pleasure Craft Operator Card. Call 250.726.2697 for more details.